Now for a fun side project! 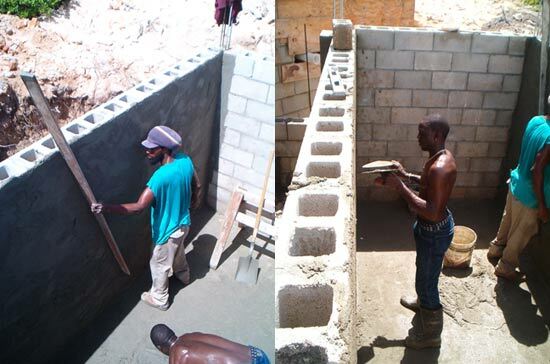 Caribbean construction of the septic system. 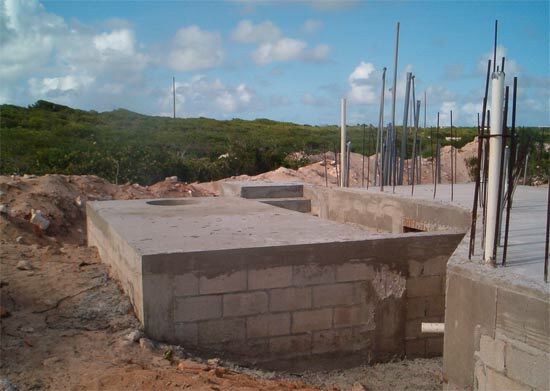 Initially it was supposed to be a standard septic system, but because we are so close to the sea, the initial plans we submitted to the Building Board came back with a change requirement. The standard septic system was replaced with a "sewage treatment package". Higher probability of water saturating the ground around the septic system which would lead to an ineffective septic system. My question for Mike was, how are these systems different? Mike says that typical septic system uses a one/two/three chamber process where the water passes through the system and eventually soaks away into the ground or leaching field. The water from the septic system cannot be reclaimed. The sewage treatment package on the other hand, treats the effluent coming from the house. The basic principle of a sewage treament package is to introduce air into the effluent water thereby keeping the bacteria in the water in a very healthy state which in turn, accelerates the break down process. The manufacturers claim that this system is so good that it cleans the effluent water to a point where it is once again potable! We definitely have confidence in this system but we haven't tried drinking any of the septic water, yet (I'm not sure we ever will, ha ha!). Instead, we are going to use it for irrigation purposes. This works out great because we get to use the same water twice. We purchased the "Aquarobic" system. Michael Fleming is the exclusive distributor for this product on island. 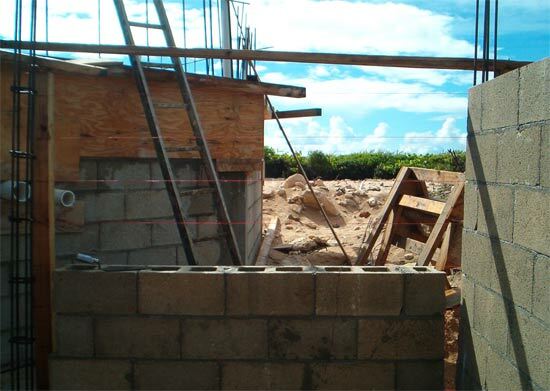 He is very knowledgeable in this field and was very helpful in the designing and sizing of our system. 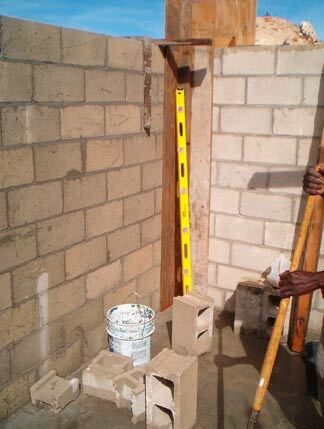 But he wanted to build it as early as possible so it could double up as a holding tank for the water that we would be needing during the construction process. 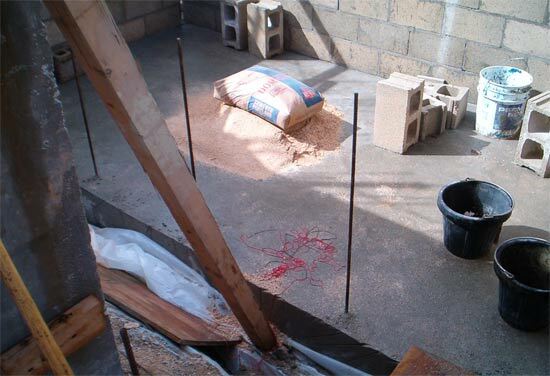 On top of that, it was placed in such a way that it would also act as a retaining wall for the steps going down to the basement mechanical room. Mike doesn't miss a beat. 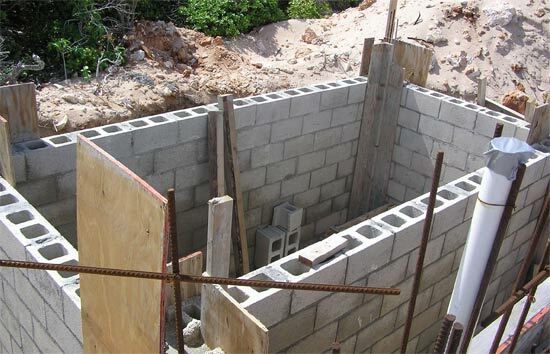 The last steps of the Caribbean construction for our septic system? The outsider walls will be plastered and painted. And of course, don't forget putting all of the hardware in place that makes up the sewage treatment package. Normally, the septic system is such a dismal topic, but the system we are using puts a smile on my face. We get a double use from not just the water, but the walls of the holding tank, too!